16th Street station (Oakland Central) is an abandoned Southern Pacific Railroad station in Oakland, California, United States. The Beaux-Arts building was designed by architect Jarvis Hunt, a preeminent train station architect, and opened in 1912. The station has not been served by trains since 1994. The original 16th Street depot was a smaller wood structure, built when the tracks were on the shoreline of San Francisco Bay. Later the shoreline was filled and now lies nearly a mile west. It was replaced in 1912 by a Beaux-Arts building designed by architect Jarvis Hunt. For decades the 16th Street station was the main Oakland station for Southern Pacific (SP) through trains. It was a companion (or "city station") for Oakland Pier, two miles away, where passengers could board ferries to San Francisco. (After 1958, the ferries were replaced by buses from 16th Street station to the SP's Third and Townsend Depot). The elevated platforms were used for the SP-owned East Bay Electric Lines commuter service (renamed IER in 1938). 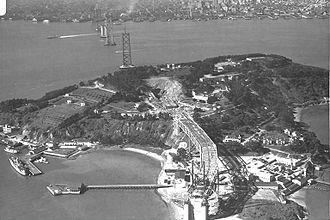 Many IER trains were expressed past 16th Street when the Bay Bridge opened in 1941. When the IER folded in 1941, some lines were sold to the competing Key System; however, the Key System only served the station with a surface line on 16th Street, and did not use the elevated platforms. 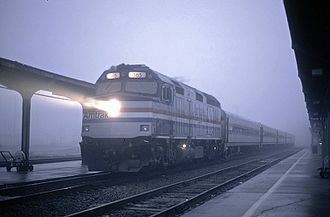 Amtrak took over intercity passenger rail services in 1971. 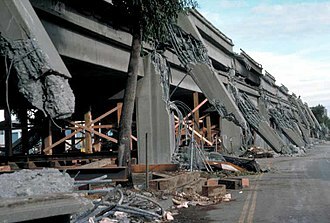 The station was severely damaged in the 1989 Loma Prieta earthquake, but continued serving trains at an adjacent building. 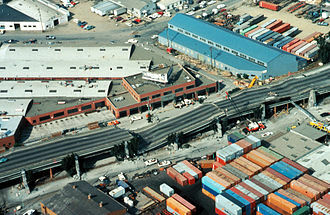 In the 1990s, the adjacent railroad tracks were moved west during the construction of Interstate 880 (to replace the earthquake-destroyed Cypress Street Viaduct), which isolated the station from the tracks. 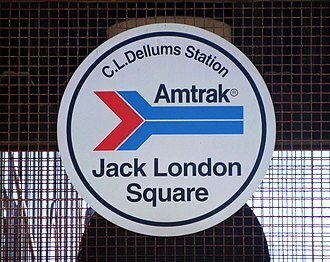 Amtrak service to 16th Street station ended on August 5, 1994; Oakland passengers used a bus connection from the 1993-opened Emeryville station until Oakland's new main station, Oakland-Jack London Square, opened in 1995. The station buildings are largely intact, including the interlocking tower and ironwork elevated platforms. The station was purchased in 2005 by BUILD, an affiliate of BRIDGE Housing, and is being restored as part of a local redevelopment project. In 2015, the station was used to stage a local opera company's production of Lulu. The station was used in films including Funny Lady (as Cleveland station), RENT, and Hemingway & Gellhorn (as a stand-in for the Hotel Florida). Mumford & Sons filmed their music video for "Babel" in the station. The station also appeared in the video game Watch Dogs 2. ^ "Amtrak National Timetable Revised Edition: Fall/Winter 1993/1994". Amtrak. February 14, 1994. p. 8 – via The Museum of Railway Timetables. ^ "Hotline #839". 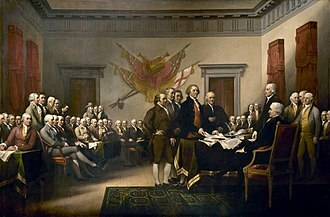 www.narprail.org. National Association of Railroad Passengers. 19 Aug 1994. Archived from the original on 2013-10-04. Retrieved 31 Jul 2012. ^ Burt, Cecily (28 Dec 2008). "Shuttered but not forgotten: 16th Street depot ready for rebirth". Oakland Tribune. 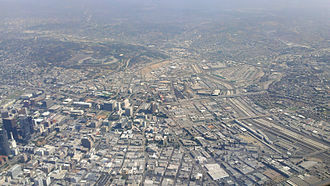 San Jose, California: MediaNews Group. Retrieved 18 Feb 2014. ^ Geberen, Janos (April 8, 2015). "Will Lulu Do a Karenina at West Edge Opera?". San Francisco Classical Voice. ^ Pollock, Christopher. Reel San Francisco Stories: An Annotated Filmography of the Bay Area. Lulu. p. 88. ISBN 9780578130422 – via Google Books. ^ Paiva, Troy (2013). Night Vision: The Art of Urban Exploration. Chronicle Books. p. 61. ISBN 9780811875783 – via Google Books. ^ Mendelson, Aaron; Rancaño, Vanessa (October 1, 2012). "Oakland's historic 16th Street station celebrates centennial, new role in community". Oakland North. ^ Whitlock, Cathy (December 31, 2011). "The Sets of Hemingway & Gellhorn". Architectural Digest. ^ "Where should Treasure Island Music Festival 2017 relocate?". San Francisco Chronicle. October 7, 2016. Wikimedia Commons has media related to 16th Street station (Oakland). Fremont station is located in Fremont, California and is served by Amtraks Capitol Corridor and the Altamont Corridor Express. The Station is located in Alameda County, the Altamont Corridor Express serves the station on weekdays. Amtraks Capitol Corridor stops 14 times daily, with seven trains in each direction, the Coast Starlight passes the station daily, but does not stop. Amtrak tickets can be purchased from the QuikTrak machine located inside the waiting area. The station has two outside-boarding platforms, platform 1, nearest the station on the north side of the tracks, is of standard length for Capitol Corridor trains. Platform 2, on the side of the tracks, is a short platform. The Fremont Boulevard grade crossing is immediately to the west of the station, passengers board the train from the road. Of the 74 California stations served by Amtrak, Fremont was the 36th-busiest in FY2012, AC Transit has a bus stop across the street, served by Lines 210,99, and Transbay bus U. Line 216 and All-Nighter 801 serve the station on nearby Peralta Blvd, Lines 99 and 216 connect this station to the Fremont. Bakersfield station is a train station in Bakersfield, California. It is the terminus of Amtrak Californias San Joaquin route, with Amtrak Thruway Motorcoach service continuing to Amtrak stations and bus stops throughout Southern California. The station opened with a celebration on July 4,2000 and it contains an 8,300 square feet station,2 tracks, and a 15-bay bus station. The original operator for train service on line was the Atchison, Topeka. Their station was located at the intersection of 15th Street and F Street and it was constructed in 1899 and demolished in 1972. 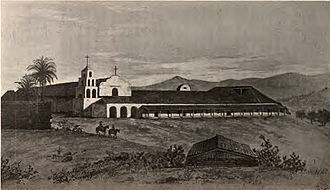 Named Santa Fe passenger trains served at the station included the San Francisco Chief, starting in 1974, Amtrak operated out of a temporary station at that site, until this station was constructed. Construction of the San Francisco and San Joaquin Valley Railroad reached Bakersfield in 1898, they would not construct a train station in the city, because once completed, the railroad was purchased by Atchison and Santa Fe. It would obtained trackage rights over Tehachapi Pass from the Southern Pacific Railroad and they constructed the Bakersfield Santa Fe Station in 1899, at the intersection of F Street and 15th Street. The station occupied two blocks of land, between D Street and F Street, a Harvey House was located on the east side of the station. In 1901, the Bakersfield and Kern Electric Railway was relocated to serve the station and it provided a direct connection between the Bakersfield Santa Fe Station and the Bakersfield Southern Pacific Station. In 1938, Santa Fe began operating intermodal rail service on the San Joaquin Valley line, trains would travel between Oakland and Bakersfield on the railroad line. At Bakersfield passengers would transfer to one of several bus routes, as a result, bus bays were constructed at the station. 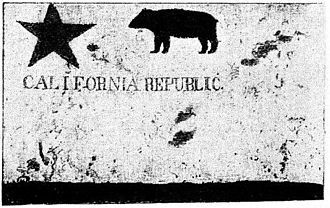 Service continued until 1971, when Amtrak was formed, since a rail route along the coast and in the San Joaquin Valley was considered redundant, the San Joaquin Valley route was dropped. In 1972, the station was demolished by Santa Fe and replaced with freight offices. However, train service restarted only two later, in 1974. 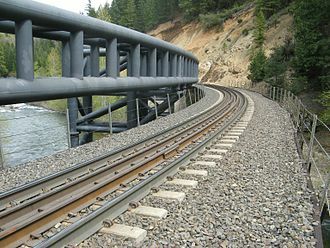 It was decided to use the route previously used by Santa Fe. At its height during the 1940s, the Key System had over 66 miles of track. The local streetcars were discontinued in 1948 and the trains to San Francisco were discontinued in 1958. The Key Systems territory is served by BART and AC Transit bus service. 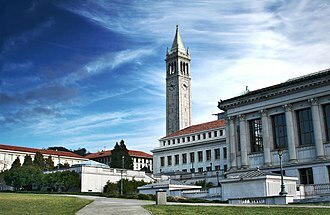 The Key System began as the San Francisco and San Jose Railway, service began on October 26,1903 with a 4-car train carrying 250 passengers, departing downtown Berkeley for the ferry pier. 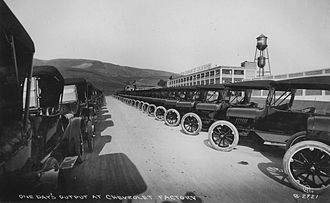 The company touted its key route, which led to the adoption of the name Key System, in 1908, the SFOSJR changed its name to the San Francisco, Oakland & San Jose Consolidated Railway, changed to the San Francisco-Oakland Terminal Railway in 1912. This went bankrupt in December 1923 and was re-organized as the Key System Transit Co. transforming a marketing buzzword into the name of the company. Following the Great Crash of 1929, a company called the Railway Equipment & Realty Co. was created. In 1938, the became the Key System. During World War II, the Key System built and operated the Shipyard Railway between a station in Emeryville and the Kaiser Shipyards in Richmond. National City Lines acquired 64% of the stock in the system in 1946, jay Quinby hand published a document exposing the ownership of National City Lines. The new owners made a number of rapid changes, in 1946 they cut back the A-1 train route and the express trains in 1947. The company increased fares in 1946 and in both January and November 1947, during the period there were many complaints of overcrowding. They were convicted of conspiring to monopolize sales of buses and supplies and they were acquitted of conspiring to monopolize the ownership of these companies. In 1948 they proposed a plan to all the streetcars to buses. They placed an advertisement in the local papers explaining their plan to modernize and motorize Line 14, Oakland city council opposed the plan by 5–3. The Public Utilities Commission supported the plan which included large fare increases, in October 1948,700 people signed a petition with the PUC against the Key System, seeking restoration of the bus service on the #70 Chabot Bus line. Emeryville is an Amtrak station in Emeryville, California that replaced the older Amtrak 16th Street Station in Oakland. 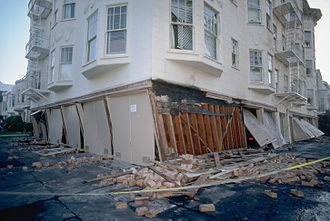 The original Beaux-Arts Oakland 16th Street Station was declared due to unreinforced masonry after sustaining damage in the Loma Prieta earthquake of 1989. Emeryville opened on August 13,1993, although service continued at Oakland for another year, the station is served by Amtrak Californias Capitol Corridor and San Joaquins and Amtraks Coast Starlight. 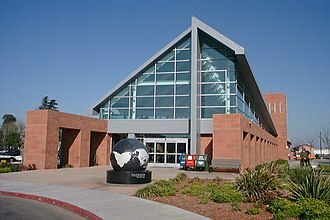 Of the 74 California stations served by Amtrak, Emeryville was the fourth busiest in FY2012 and this Station is located in Alameda County. Extensive Amtrak Thruway bus connections are available in Emeryville, Route 99 connects all arriving and departing trains with San Francisco. Additional connections are provided by Route 17 to Santa Barbara and Route 34 to Stockton, several public transit bus lines serve the station vicinity, The free Emery Go-Round Hollis and Hollis South routes stop on Horton Street, across the street from the station. Chicago Union Station is a major railroad station that opened in 1925 in Chicago, replacing an earlier station built in 1881. 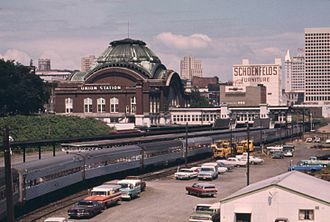 It is the only remaining intercity rail terminal in Chicago, as well as being the primary terminal for commuter trains. The station stands on the west side of the Chicago River between West Adams Street and West Jackson Boulevard, just outside the Chicago Loop, including approach and storage tracks, it is about nine and a half city blocks in size. 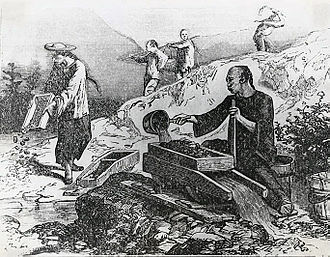 Its facilities are underground, buried beneath streets and skyscrapers. Chicago Union Station is the third-busiest rail terminal in the United States, after Grand Central Terminal and it is Amtraks overall fourth-busiest station. It handles approximately 120,000 passengers on a weekday and is one of Chicago’s most iconic structures, reflecting the city’s strong architectural heritage. In addition to standing out architecturally, Union Station has features that reflect its commitment to sustainability, in 2011, its lighting system was replaced with more energy-efficient light bulbs and motion sensors, reducing the station’s carbon footprint by 4 million tons annually. Chicago Union Station was designated as one of America’s “Great Places” in 2012 by the American Planning Association. The “Great Places” program by APA highlights places streets and public spaces around America that exhibit “exemplary character and planning. ”These places are unique in their cultural and historical significance, sense of community, and vision. Other criteria include “architectural features, accessibility and community involvement. ”Chicago Union Station is considered a “Great Public Space” by APA and these spaces are safe and inviting, well-maintained, and attractive, both visually and in functionality. 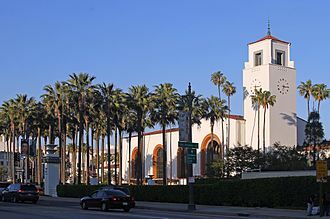 In addition, local culture and history are reflected within the space, Union Station is laid out with a double stub-end configuration, with 10 tracks coming into the station from the north and 14 from the south. Because passenger trains do not pass through Union Station, all passengers traveling through Chicago must change trains to reach their final destination. There are 2 through tracks to allow out-of-service equipment moves between the north and south side, including one with a platform to allow extra long trains to board, between the north and south sides of the station is a passenger concourse. 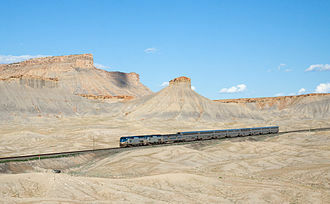 The Capitol Corridor is a 168-mile passenger train route operated by Amtrak in California. Capitol Corridor trains operate between San Jose and Sacramento, roughly parallel to Interstate 880 and Interstate 80, one train a day continues through the eastern Sacramento suburbs to Auburn, in the foothills of the Sierra Nevada. Capitol Corridor trains started in 1991, the Capitol Corridor is named because it links the location of Californias first state capitol, San Jose, with the current location, Sacramento. 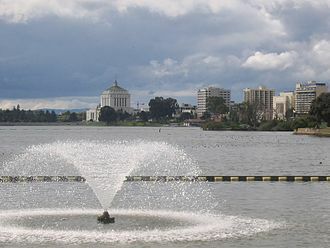 The rail route travels near historical state capitol locations of Vallejo, at the start of the 1990s three Amtrak trains operated in the Bay Area, the long-distance California Zephyr and Coast Starlight, and the short-distance San Joaquin. 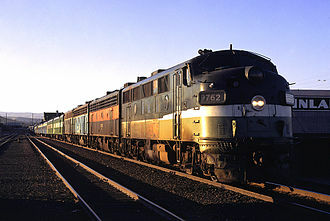 Only the Coast Starlight ran once a day between San Jose and Sacramento, and at inconvenient times, the last local service between the two former capitals was the Southern Pacifics Senator which ran between Oakland and Sacramento until May 31,1962. In 1990 California voters passed two propositions providing $105 million to expand service along the route, the new service, named Capitols, debuted on December 12,1991 with three daily round-trips between San Jose and Sacramento. Of these, a single round-trip continued to Roseville, an eastern Sacramento suburb, the service was renamed Capitol Corridor to avoid confusion with the Capitol Limited, which runs between Washington, D. C. and Chicago. 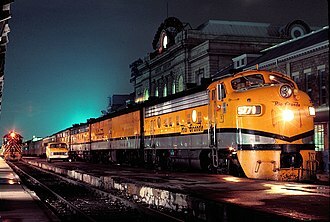 In 1998 there was one round trip train that ran as far as Colfax, most eastbound Capitol Corridor trains terminate in Sacramento, with Amtrak Thruway bus connections to destinations farther east. Only one daily train runs as far as Auburn, new stations have been proposed along the route at Hercules, northern Fairfield/Vacaville and Dixon. The northern Fairfield–Vacaville station is being developed by the cities of Fairfield and Vacaville near the corner of Peabody Road, the station is being planned and paid for by BART and the city of Union City. Preliminary work had started to add second pair of tracks between Oakland and San Jose, which would enable most trains to run from Sacramento to San Jose, an expansion to Truckee and Reno, Nevada on the UP line over Donner Pass has been considered. Revenue in FY2012 was $27,927,540, an 8. 6% increase over FY2011 and it is the fourth busiest Amtrak route by ridership, surpassed only by the Northeast Regional, Acela Express, and Pacific Surfliner. As of 2013 Sacramento is the busiest station on the route, the Capitol Corridor is used by commuters between the Sacramento area and the Bay Area as an alternative to driving on congested Interstate 80. Monthly passes and discounted tickets are available. Starting on August 28,2006 the Capitol Corridor had 16 weekday trains each way between Oakland and Sacramento, up from twelve in 2005 and three in 1992, according to its management, ridership on the Capitol Corridor trains tripled between 1998 and 2005. Starting August 13,2012 the Capitol Corridor dropped from 16 to 15 weekday trains each way between Oakland and Sacramento, as of February 2013 no weekday trains run the full length of the line between Auburn and San Jose. The single departure from Auburn runs to Oakland Coliseum, of the 14 westward departures from Sacramento seven run to San Jose, seven trains run San Jose to Sacramento, six downtown Oakland to Sacramento, one Coliseum to Sacramento and one Oakland to Auburn. Fremont station, as seen from SR&nbsp;84. Exterior of Centerville SP depot with Cafe ads. A Van Hool C2045L Amtrak California Thruway Motorcoach at the Bakersfield station.